An artist's impression of a supernova and its host galaxy, as they would appear if gravitationally lensed by an intervening black hole. Scientists have ruled out black holes as a possible source for most of the elusive dark matter scattered throughout much of the universe. Dark matter seems to make up more than 80 percent of the matter in the universe, yet it remains one of the most mysterious entities in the cosmos. In 2015, gravitational waves were detected from two colliding black holes using the Laser Interferometer Gravitational-Wave Observatory. Following this discovery, some astronomers thought black holes could be the source of the universe's dark matter — but a new study suggests otherwise. "We are back to the standard discussions. What is dark matter? Indeed, we are running out of good options," Uroš Seljak, study co-author and professor of physics and astronomy at UC Berkeley, said in the statement. "This is a challenge for future generations." 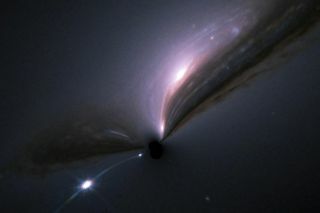 Specifically, the researchers found that no intervening black holes, which could act as gravitational lenses, magnified or brightened the 740 supernovas studied. If black holes were the primary source of dark matter in the universe, then the researchers would have found more supernovas magnified by primordial black holes, which arose soon after the Big Bang, the statement said. Therefore, none of the universe's dark matter consists of heavy black holes or any similar object, including massive compact halo objects (MACHOs). Rather, based on the new analysis, black holes can account for no more than 40 percent of the dark matter in the universe, the researchers said. A follow-up study of 1,048 black holes is also in the works. The researchers expect that this study will reduce the possibility even more, showing that black holes are the source of as little as 23 percent of the universe's dark matter, according to the statement. Their findings were published Oct. 1 in the journal Physical Review Letters.